In late August, CMS released the 2017 performance year results for the Medicare Shared Savings Program (MSSP). The big news was that the program generated net savings for CMS for the first time, as ACOs saved the federal government $313.7 million. Most high-level trends persisted from previous years: ACOs with more time in the MSSP program and high benchmarks were more likely to earn savings than newer ACOs or ACOs with low benchmarks. The results also came at a time when CMS was mulling over program changes that would result in more ACOs taking on risk. However, by combining public utilization file (PUF) data from 2014 to 2017, we can develop insights into how individual ACOs changed over the course of the program, as well as what factors drove changes in their expenditures. These changes can then be compared to other benchmark groups, such as all ACOs in the program or ACOs that earned shared savings in a given year. 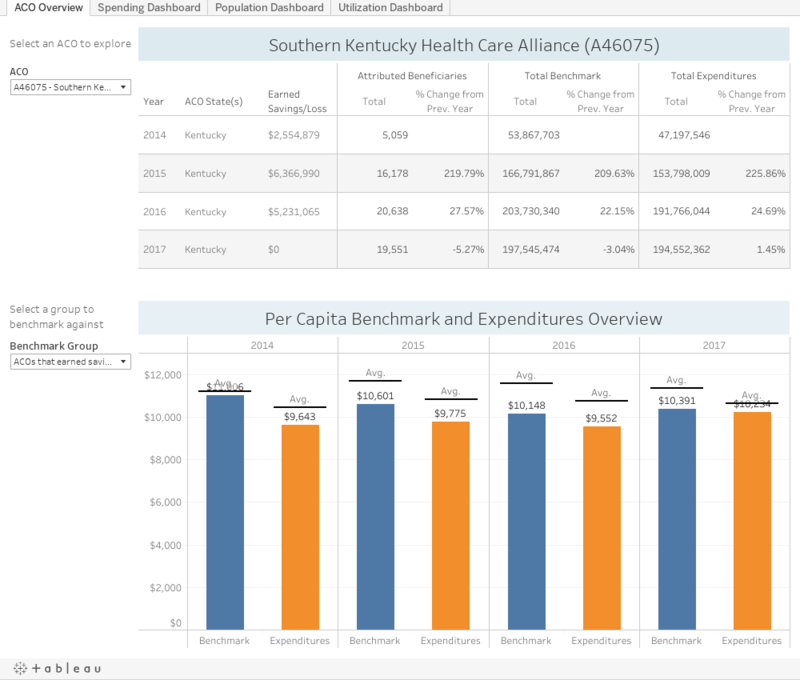 We invite you to use our Tableau dashboard to explore your ACO’s performance and how it compares to others in the program. This includes insights into benchmarks and expenditures, the make-up of an ACO’s patient population, their associated risk, and the utilization of primary care services.